CScout Japan reported on 30 June 2007 they saw Sega Toys’ new Private Ocean at the Tokyo Toy Show. Somewhat similar to Ant’s Life Studio, but it has over 100 different ocean creatures. Private Ocean becomes your own private ocean. You can change the background and the screen is backlit if different colors. It includes touch sensors (touching the top sensor gets the fish to swim together and spell out the date and time, touching the bottom sensor scares them off. 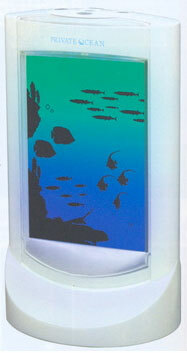 It is somewhat of a small virtual aquarium featuring ocean life in the wild. If you connect and MP3 player or i-Pod, the fish dance to the music. They report Private Ocean is to be released in October 2007.